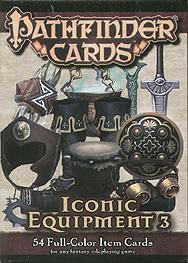 Claim the gear of the Pathfinder Rolplaying Game's most famous heroes, from the alchemist and shaman to the warpriest and brawler, with the Iconic Equipment 3 Item Cards! This 54-card set of beautifully illustrated, full-colour Item Cards lets you add a whole new dimension to your game and show your players all the loot they find during their adventures! Each card includes note space on the back, allowing players to keep track of what they know about their treasure. Item cards are designed for the Pathfinder RPG, but are usable with any fantasy roleplaying game.